The contractor you choose to work with is one of the most significant factors in your siding project’s success. The right contractor can ensure your peace of mind, provide quality craftsmanship, and offer a range of products and services. Certifications are an effective way to determine the quality of the contractor. We are proud to be a CertainTeed 5-Star Contractor. Learn how this can benefit you. Manufacturer’s certifications are important because they prove the knowledge and skill of the contractor that earns them. 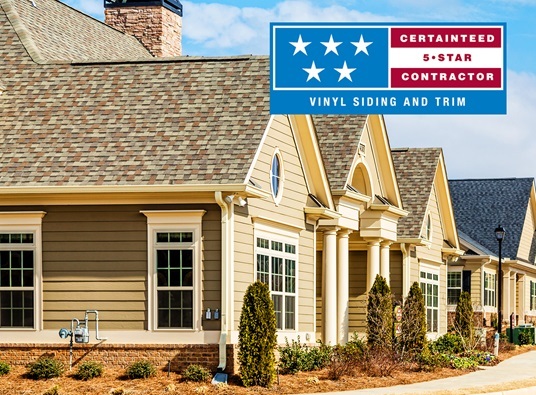 When we say that we’re one of the best siding contractors in Manassas, VA, we mean it because we have earned CertainTeed’s 5-Star Contractor status. To earn this designation, we had to meet strict standards. We had to complete Master Craftsman training and to maintain a positive reputation within the community. As any expert contractor or handyman in Manassas, VA, can tell you, proper knowledge and training is one of the most important things in our industry. As a 5-Star Contractor, we’ve proven that we have totally mastered the installation, maintenance, and repair of CertainTeed’s full line of products. The Master Craftsman coursework provides advanced education and ongoing training. This ensures that you’ll receive the best service possible. In addition, being an expert in siding and gutters in Manassas, VA, means we won’t simply rest in our laurels. To maintain our 5-Star status, we must have a good reputation within the community. We have to do our best with every customer that we work with. You can also depend on us to offer more and better siding products. Te 5-Star status means that we can offer CertainTeed’s full line of products because we’ve passed their rigorous tests and installation training. As a CertainTeed 5-Star Contractor, we have proven our mastery of CertainTeed’s full line of products. This will ensure your peace of mind because you know our siding installation will be perfect. In addition, we receive continuous education and training to keep our skills sharp. Peak Roofing Contractors has a proven record of outstanding customer services and quality workmanship. Give us a call to learn more about our 5-Star Contractor status or to get a free estimate.